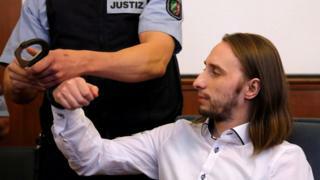 A man who bombed the Borussia Dortmund football team bus in 2017 has been given 14 years for attempted murder. Sergei Wenergold, a German of Russian origin, had hidden bombs packed with metal pins which went off as the bus passed a hedge on its way to a Champions League quarter-final match. The blast, which wounded two people, was initially treated as a suspected jihadist attack. But Wenergold admitted the plot, saying he had not meant to hurt anyone. In a bizarre twist, it emerged that the 29 year old had planned to make money out of the bombing by betting on a fall in Borussia Dortmund’s stock market price. Dortmund’s Spanish defender Marc Bartra and a police officer were wounded in the attack. Wenergold was convicted of 28 counts of attempted murder.